This week we are headed to the Czech Republic for our ornament inspiration. In the Czech Republic, St. Nicholas comes on December 6th climbing down to earth on a golden rope with at least one angel and devil. Children tell him whether they have been good or bad and receive a basket of small present similar to a stocking. 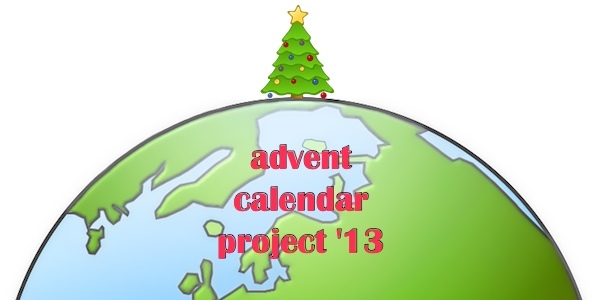 The main celebrations are on Christmas Eve and this is when larger presents are given. Some people fast during Christmas Eve in the hope that they will see a vision of ‘the golden pig’ appear on the wall before dinner. This is meant to be a sign of good luck. 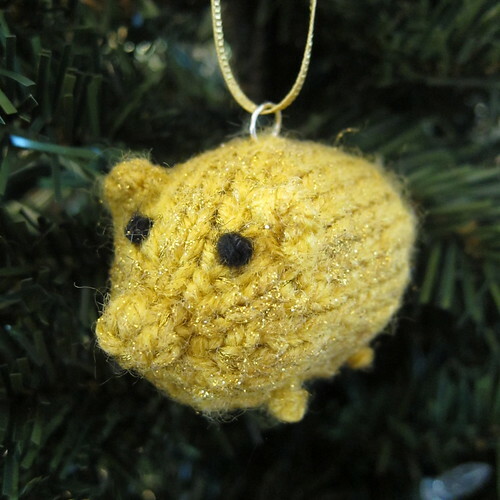 For our ornament, we’ve knit up a golden pig based on our Flying Pig pattern. Now you don’t need to fast to see the golden pig! There are lots of different ways you can make your pig golden, use a yarn with gold in it, knit gold embroidery floss in with the yarn or add gold glitter to the finished pig. I did both of the last two. First I knit 3 strands of gold embroidery floss with the yarn. It wasn’t as shiny as I wanted to I added some gold glitter paint to the top. The size of your finished pig will depend on what weight yarn you use. My pig is about 2.5 inches long and made with worsted weight, but it is knit very tightly which can be a little tricky. Gauge: Isn’t super important for this pattern, you just want to make sure it is tight so the stuffing doesn’t show through. Cast on 6 stitches. 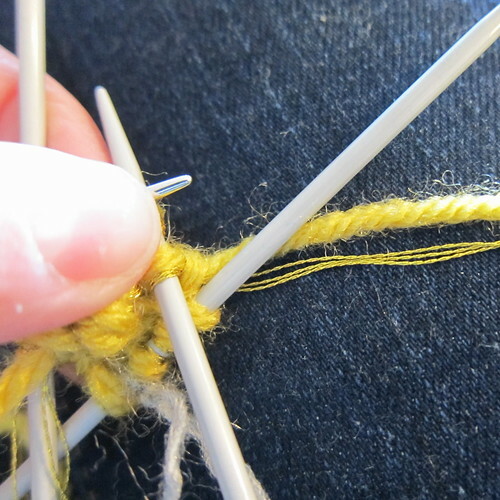 Place them evenly on 3 double pointed needles & join together without twisting. Put a stitch market between the first and last stitch to mark the row. For the feet I just knotted until I liked the size of the knot (for me that was three times) and then sewed the knot into place. I repeated this for all four legs. Open a jump ring and insert it into the back of the pig. Close the jump ring. Tie ribbon through the jump ring into a loop to hang.